A Constitution Bench of the Supreme Court has removed the legal protection available to senior bureaucrats from being probed for corruption by the CBI. Section 6A was inserted in the Delhi Special Police Establishment Act in 2003 to protect officers from false complaints and consequences of bona-fide mistakes made in normal decision-making. IN a multi-lingual nation like India the choice of the language of instruction has major ramifications on education and indeed on the future of a child. Most children receive their basic education in their mother tongue. English, however, has a special attraction as a language of instruction since proficiency in this language is seen as a major step towards career advancement. Just before Prime Minister Vajpayee's Lahore bus yatra his predecessor, Mr. Inder Gujral, told me that Nawaz Sharif appeared to be a realistic, reasonable and rational leader. He recalled a conversation on Jammu and Kashmir, when Sharif, a Kashmiri hailing from Anantnag, who was known to be an uncompromising hardliner on Kashmir, had realistically remarked: “Hum jaante hain ki ham Kashmir aapse le nahin sakte aur aap humko Kashmir de nahin sakte” (“I know we cannot seize Kashmir from you and you cannot give Kashmir to us”). Learning is a life-long process provided one is open to learn and, as my experience shows, one learns the most from the people one comes across. Thanks to my vaulting ambitions and job-hopping skills, I could grab a corporate position in a Karnataka-based company at a very young age. The Chairman of the company, who headed a big industrial house, was operating from Mumbai and would visit the plant site hardly once a year. A	controversy stirred by a recent article on the Air Force being at war with Hindustan Aeronautics Limited (HAL) and wanting to import rather than build an indigenous a trainer, was discussed in the print and visual media for a few days, but seems to have lost the public interest. The pot, however, has been kept boiling through some well-timed 'plants'. A Constitution Bench of the Supreme Court has removed the legal protection available to senior bureaucrats from being probed for corruption by the CBI. Section 6A was inserted in the Delhi Special Police Establishment Act in 2003 to protect officers from false complaints and consequences of bona-fide mistakes made in normal decision-making. One unwelcome outcome of the judgment, it is feared, may be that officers will now avoid taking risky decisions. The questioning and arrest of certain top bureaucrats in the telecom and coal scams also generated such fears and consequent government indecision and policy paralysis to some extent. But such fears are unfounded because officers cannot be hauled up unless the intent to do corruption is evident and proved. A mere questioning should not upset officers if they have nothing to hide. As honest citizens, they should rather cooperate with investigating agencies. Lately networks of high-level corruption involving politicians, bureaucrats and criminals have flourished. The public at large will welcome any move to break these networks and rein in corruption. Prior government approval for investigation puts the wrong-doer on notice and gives him time to clean up his act. A surprise raid, on the other hand, can yield useful evidence. An independent, efficient CBI investigation is hampered if the agency is fettered with the condition of seeking prior sanction. The court has also objected to the classification of civil servants on the basis of their status in government service. Giving protection to senior public servants and denying it to those below a particular rank violates the fundamental right to equality provided in Article 14 of the Constitution. This is the third time that the Supreme Court has ruled on this issue. In the Vineet Narain case in 1997 the court struck down the selective protection given at the top level. A year later the Centre restored the shield through an Ordinance, which was also held invalid. In 2003 the NDA government inserted Section 6A in the Act, which has now been found unacceptable despite a spirited defence by the UPA legal eagles. IN a multi-lingual nation like India the choice of the language of instruction has major ramifications on education and indeed on the future of a child. Most children receive their basic education in their mother tongue. English, however, has a special attraction as a language of instruction since proficiency in this language is seen as a major step towards career advancement. While government schools teach students in their mother tongue, and are far more inexpensive than private schools, the number of parents who put their children in various 'English-medium schools' to give them an edge is a legion. State governments have sometimes tried to force the language of the state as a language of instruction for schools. Karnataka did so 33 years ago when it ordered English-medium schools to teach in Kannada or in the mother tongue of the students. The order was challenged, and went through various judicial and even legislative procedures, but the issue remained unresolved. The Supreme Court's decision that the right to choose the medium of instruction in which their children study in schools is a basic right of children and their parents is to be lauded. Most students in India are multi-lingual, but for many the road to advancement is signposted in English. To follow this path, many parents would forego the state educational system, where the language of instruction remains the regional language, and enroll their children for private education. Since they are ready to pay for their choice, they have the right to get their children educated in a medium of their choice. The Constitution Bench's judgment that the imposition of mother tongue affects the fundamental rights under Articles 19, 29 and 30 of the Constitution is logical and it should go a long way in combating linguistic chauvinism that sometimes clouds educational policy of the county. THE Englishman publishes a remarkable article on this subject. It begins by quoting the opinion of "the majority of Europeans" that the mixture of blood has produced a race which has not the qualities which fit it for success in life. It then asserts "there is patent evidence that the race as a whole and apart from exceptional individuals is in a position of poverty which in the case of some sections of it is not far removed from degradation." On this basis, viz., that a section of the community is exposed to poverty bordering on degradation, it condemns the whole community, taunts them with the remark that as a race they have been unable to keep pace with others, warns them that a mere change of name does not help them to rise in the scale and finally advises them to find out "in what direction its genius lies and devote itself to developing its latent talents." INDIA is visited not merely by the periodic famines which bring hunger and starvation to many millions of population. There is also the eternal famine of ignorance which accounts for more than half the ills that the people are suffering from. The only way to eradicate this is to educate the people and to adopt a wide and comprehensive scheme of education. Though the Government of India have accepted their full responsibility in this matter and have for the present undertaken to increase primary schools by 75 per cent and double the number of pupils, no time is fixed within which this improvement is to be effected. Just before Prime Minister Vajpayee's Lahore bus yatra his predecessor, Mr. Inder Gujral, told me that Nawaz Sharif appeared to be a realistic, reasonable and rational leader. He recalled a conversation on Jammu and Kashmir, when Sharif, a Kashmiri hailing from Anantnag, who was known to be an uncompromising hardliner on Kashmir, had realistically remarked: “Hum jaante hain ki ham Kashmir aapse le nahin sakte aur aap humko Kashmir de nahin sakte” (“I know we cannot seize Kashmir from you and you cannot give Kashmir to us”). Sharif's comments were made after his election in 1997 when, with his patronage, Hafiz Mohammed Saeed, emerged as the most influential Jihadi leader in Pakistan, dedicated to “unfurling the green flag of Islam in New Delhi, Washington and Tel Aviv”. Sharif is incredibly hospitable. He is a great fan of Bollywood films and loves listening to songs of Lata Mangeshkar, Mohammed Rafi and Kishore Kumar. Hindi film songs were played during a lunch Sharif hosted for Mr. Vajpayee. But his authoritarian streak was evident when he refused to allow Leader of Opposition Benazir Bhutto to meet Mr. Vajpayee. Moreover, Mr. Vajpayee's aircraft had barely taken off from Lahore, when "Khalistan" slogans and propaganda designed to incite visiting Sikh pilgrims from India were unleashed across gurdwaras in Lahore and Nankana Sahib. Unknown to Indian intelligence and the Army, units of Pakistan's Northern Light Infantry were being infiltrated across the Line of Control in J&K. Mr. Sharif was briefed about the Kargil intrusions, both in Rawalpindi and Skardu. Did he not see the contradiction between embracing Mr. Vajpayee on the one hand and unleashing the Pakistan Army to cross the LoC on the other? On February 12, 1993, during Sharif's first term as Prime Minister, multiple bomb blasts rocked Mumbai, resulting in 350 fatalities and injuries to around 1,200 persons. While Dawood Ebrahim, now a resident in Karachi, organised the explosions, the trail led to the involvement of Sharif's handpicked ISI chief, Lieut-Gen Javed Nasir, and Sharif himself. Moreover, despite what Sharif told Mr. Inder Gujral, the reality is that he does not hesitate to raise the issue of Jammu and Kashmir at every conceivable occasion in Pakistan and when abroad. Sharif has sought to present Kashmir in the Islamic world as an issue of occupation of Muslim lands. Whether he would be amenable to adopting a more realistic path, in keeping with what he told Mr. Gujral, remains to be seen. The world has after all changed dramatically since he was ousted and forced to leave for Saudi Arabia in 1999. 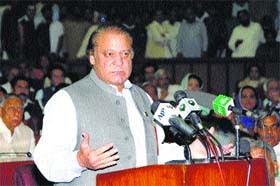 Sharif entered politics as a protégé of President Zia-ul-Haq and Zia's Governor of Punjab, Lieut-Gen Ghulam Jilani Khan. His father, long persecuted by Bhutto, was a natural ally of Zia's military regime. After a brief tenure as Chief Minister of Punjab, Sharif was catapulted to power as Prime Minister in 1990, heading an alliance of Islamist parties put together by the Army Chief, Gen Aslam Beg, and the ISI chief, Lieut-Gen Asad Durrani. But, despite having been catapulted to power by the Army, Sharif has been at constant loggerheads with the successive Army Chiefs. During his first term he was accused by the wife of Army Chief Asif Nawaz of being responsible for her husband's death. He was then sacked by Nawaz's successor Waheed Kakkar following differences with President Ghulam Ishaq Khan. In his second term, he chose to sack the mild-mannered Army Chief, Gen Jehangir Karamat. General Musharraf, whom he appointed to replace Karamat, ousted him from power before imprisoning and exiling him to Saudi Arabia over differences on who should take the blame for the Kargil fiasco. Even in his third term, Sharif's relations with his hand-picked Army Chief Raheel Sharif have been uneasy over the manner in which General Musharraf is being treated in cases filed against him. Moreover, disregarding the advice of the Army, Sharif has got involved in an uncertain "peace process" with the Tehriq-e-Taliban Pakistan (TTP). Sharif is also involved in political rivalry with Imran Khan over who is a greater supporter of extremist Sunni Islamist outfits. Matters are complicated by the symbiotic relationship between the TTP and the Afghan Taliban. Thus, while a so-called “peace process” is underway between the Sharif Government and the TTP, the Pakistan armed forces are not observing the ceasefire and Pakistan Air Force jets are bombing and strafing TPP hideouts. An already volatile situation along the Pakistan-Afghanistan border is set to become even more tense and complicated. The prevailing situation can only strengthen the Wahhabi-oriented extremist groups in Pakistan, as Sharif and Imran Khan compete for political space across the radical Islamic right. Given the sullen mood in the Army, which has its own axes to grind when it comes to its pet projects of “bleeding India with a thousand cuts” and seeking “strategic depth” via the Taliban in Afghanistan, the present situation is a recipe for the breakdown of governance in large parts of Pakistan. The irony is that this situation arises from rivalry between Oxford educated Imran Khan and billionaire businessman Nawaz Sharif, both of whom have enlightened views on the role of women in national life. When Sharif was incarcerated, it was his wife Kulsoom who took over leadership of his party and waged a gutsy struggle against General Musharraf. His daughter, Maryam, plays an active role in his ruling party. Contradictions in Sharif's policies are thus evident not only in his dealing with India, but also in his approach to governance domestically. He is given to acting instinctively, without a careful analysis of the consequences of his actions, like during the Kargil conflict. Sadly, few Indian leaders, perhaps with the exception of Narasimha Rao, understood how to deal with a complex personality like Nawaz Sharif. As a new government is scheduled to assume office soon in South Block, it would hopefully avoid getting starry-eyed about the prospects of immediate “break-throughs” or “uninterrupted and uninterruptable dialogue” with Pakistan! Learning is a life-long process provided one is open to learn and, as my experience shows, one learns the most from the people one comes across. Thanks to my vaulting ambitions and job-hopping skills, I could grab a corporate position in a Karnataka-based company at a very young age. The Chairman of the company, who headed a big industrial house, was operating from Mumbai and would visit the plant site hardly once a year. Soon I came to know that he was a man of few words and had his own distinct style of working. I must be only three months old in my new job when one fine morning I received a telex message from the Chairman's Secretariat: "Babuji has decided to spend a few days every month at the Belgaum unit; therefore, give an advertisement for the post of Secretary to the Chairman. You may short-list five suitable candidates whom he would interview when he visits you by month-end." I had no idea what type of a person he would like to have -- male or female, young or old, highly qualified or simply a stenographer. At the same time I did not feel it appropriate to ask him or anybody else since that he had left to me. Therefore, I used my own judgement and called five short-listed candidates on the appointed day. He made me sit with him during the interviews. In less than 40 minutes he had interviewed everybody and apprised me of his decision. He did not talk more on the subject and immediately switched over to other matters on the agenda. He was to go back by the evening flight and I was with him in the car to see him off at the airport. "Do you know why I selected that fellow?" "No, Sir, I've no idea". I replied. "Fine, I selected him because he didn't use 'actually', 'as far as I know', 'In fact' in his replies. The use of these words conveys the user's inherent fear that unless stress is made, people may not accept him as telling the truth. Well, according to me any person who tells only truth or a factual position does not have to use such words. I believe in brevity and it is possible only when you avoid verbosity and are concise. Anyway you had short-listed the right candidates and the best thing is that you didn't bother me. Keep it up", he remarked. 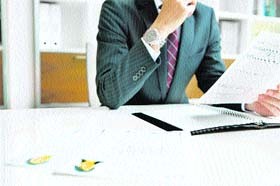 The next day I received the message: "Withhold the appointment letter. Wait for fresh instructions." Those instructions never came but after some time I realised that the lesson was for me. A controversy stirred by a recent article on the Air Force being at war with Hindustan Aeronautics Limited (HAL) and wanting to import rather than build an indigenous a trainer, was discussed in the print and visual media for a few days, but seems to have lost the public interest. The pot, however, has been kept boiling through some well-timed 'plants'. During this writer's two tenures, one as Commandant, Air Force Academy (AFA) and the subsequently as Air Officer Commanding-in-Chief (AOC-in-C), Training Command, the writer had an experience of the aircraft in question — HAL built basic trainer aircraft, HPT—32. Hence, it was felt necessary to set the record right, even though it may mean plunging headlong in to an ongoing controversy. The genesis lies in the repeated engine failures, many of them fatal, on the HPT—32, and HAL's failure to resolve the cause and provide a lasting solution. Since its induction in 1988, there have been more than 120 engine failures resulting in 13 accidents, killing 19 experienced and a few under-training pilots. That the number of fatalities is low speaks highly of the professionalism of the Indian Air Force. A fatal accident that killed two experienced instructors at the AFA in May 2009, led to a decision that enough was enough and to stop flying the aircraft — ground the aircraft in a flier's parlance — even though it meant that the IAF would be without a basic trainer for some time to come. The lack of a basic trainer aircraft created a crisis-situation, but it goes to the credit of the entire training and maintenance branches of the air force to have risen to the occasion and overcome it. Air Headquarters rendered Training Command and the basic training was transferred to the HJT—16 Kiran aircraft, even though this particular type was also on its last legs. This also entailed the closure of the much popular Surya Kiran aerobatic team, as training had to be given the due priority. 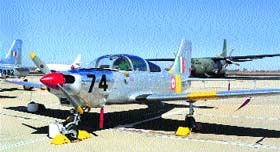 Simultaneously, the critical void thus created was recognised by the Ministry of Defence (MoD) and approval was granted in September 2009 to acquire 181 basic trainer aircraft, of which 75 were to be from the global market and the balance 106 to be supplied by HAL through indigenous production. To give the devil its due, it is pertinent to mention that HAL, on its own, had suggested a replacement for the HPT—32 as far back as October 2003. The proposal, however, did not suggest any major upgradation of technology. In addition, the residual life of a decade plus of the HPT—32 aircraft would have seen the IAF through, before a new aircraft would be required. The proposal, therefore, was considered premature. HAL took no initiative thereafter. Considering the long gestation period in aviation acquisitions, it was Air HQs that finally submitted fresh requirements and held meetings with HAL from 2007 onwards. After a series of meetings, in March 2009, the Preliminary Staff Qualitative Requirements (PSQR 06/09) were finalised and ratified by the appropriate departments at Air HQs and the MoD. The finalised PSQR was then forwarded to HAL for it to study and submit a Detailed Project Report (DPR). While awaiting the DPR, Air HQs, in May 2009, circulated a proposal for procurement of 181 aircraft as 'Make' by HAL. The nomenclature of the aircraft was HTT—40, being the one being developed by HAL as per the given PSQRs. 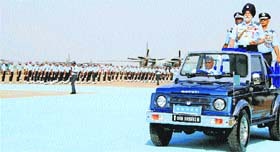 The aircraft was to be totally indigenous as it has always been the endeavour of the IAF to encourage the local aerospace industry. Meanwhile, engine failures on the HPT—32 aircraft were occurring with worrying regularity and the entire fleet was finally grounded in that very month itself. Considering the new urgency created by the lack of a basic trainer aircraft, Air HQs proposed a change from 'Make' by HAL, to 'Buy' globally the initial critical numbers, while the balance order still remained with HAL. Air HQs also approved the proposal that the PSQRs be maintained for the HAL HTT—40, and a fresh Air Staff Qualitative Requirement (ASQR) be issued for 'Buy' (Global) after receiving the responses to the Request for Information (RFI). The appropriate departments ratified the fresh ASQR and a case for the procurement of 90 aircraft was processed, with the balance 90 to be made by HAL as a separate proposal. The project for HTT—40 was still not cancelled. The Defence Acquisition Council (DAC), chaired by the Raksha Mantri, reduced the initial acquisition to 75. The Council, however, added a clause to its decision that should HAL not fly the first aircraft (HTT—40) by the time the first aircraft of 'Buy (Global) type' arrives, then the option clause would be invoked and the numbers to be made by HAL would be reviewed. The PSQRs for the HTT—40, were later realigned with the ASQR for the new aircraft and issued to HAL in December 2009. HAL, with the issue of its first project report, confirmed its acceptance in September 2010. The Ministry of Defence accorded its approval to the project report in June 2011 and at the same time instructed HAL to process a case for the sanction of funds. HAL, for whatever reasons, chose to submit a revised project report in January 2012 with an enhancement of costs. This obviously was not acceptable to the MoD. The revised report was referred back to HAL, which then resubmitted it in May 2012 with reduced costs. It was now that Air HQs, on review of the revised project report as submitted by HAL, recommended foreclosure of the HTT—40 project. It also added that should HAL be interested in obtaining the technology from Pilatus, the Swiss manufacturer whose trainer aircraft had been selected in the ensuing period, IAF would consider the balance numbers to be procured from HAL rather than from the original manufacturer. All actions as stipulated in the Defence Procurement Procedure (DPP) had been followed under close scrutiny of the MoD. Any deviation in the ASQR, as has been alleged in some media reports, would have been immediately detected and the project would not have been cleared by the Ministry. That the project cost, as submitted by HAL, was high and rejected by the Ministry, and subsequently reduced to within acceptable limits, has been conveniently missed out by the media. Having been at the receiving end of HAL's poor production and maintenance record and sheer ineptness and clumsiness, at times it so seems that the case has been projected at the behest of HAL to shroud its poor performance record. The thinking of HAL has always been that it has a 'captive customer' in the IAF and the aviation arms of the other two Services and hence, could not be bothered much about competitive costs and quality. The hype of the Air Force not encouraging indigenisation is just that — hype. About 60 per cent of the components, including the engine, were to be imported for the HAL product. The Air Force has often been at the receiving end for not encouraging indigenisation. Till date, anything and everything associated with aviation in India, more so defence aviation, had the HAL stamp on it. The reader needs to be apprised that maintaining a war machine of varied technology and origin is not an easy task. The maintenance branch of the Air Force, however, has always been encouraging small and medium enterprises to produce equipment for ensuring serviceability of the varied inventory, which otherwise is a nightmare and at the total mercy of the original manufacturers. Suffice to say, that the industry has responded and shown that it has the capability and desire, notwithstanding the high standards that are demanded in the realm of aviation and aerospace. HAL, by its own admission, has developed more that 2,000 tier—3 suppliers, but not any in the tier—1 or tier—2 categories. It has about 30-licence produced and a few indigenous aircraft to its credit. Nonetheless, it has not been able to meet the requirements of the IAF or why else would the Air Force go shopping abroad. The reputation of HAL is now at stake because the IAF, with the nod of the MoD, is wanting to break away from the stranglehold of the HAL. It has not issued a request for proposal for the replacement of the Avro aircraft, which the 'holier than thou' HAL has considered as a slight. (A project since then stalled by MoD allegedly at the behest of an outgoing Minister). HAL can still hope to salvage its battered reputation if it progresses well on the jet trainer and other projects, and delivers them as per stated schedule and costs. In aviation, initial teething problems of any new product are always present. Even the US-built Boeing 787 Dreamliner has had its fair share of initial problems. The IAF, being the professional force that it is, well understands it. This time, however, the IAF has put its foot down and will not be taken for granted anymore. HAL, for its own good should recognise the fact before it slowly but surely looses out to the private sector.